In 2000 when the Toyota Prius hit Britain’s shores (officially) for the first time its only real eco-competition was from the excellent Honda Insight, which sported only 2 seats or the Reva G-Wiz, a vehicle with the dubious honour of being classified as an electric quadricycle. Back then Nikki, our illustrious editor, was pelting around the world in a car that looked much like a Banana, and had a similar crash safety rating. My brief go at driving it demonstrated to me that the thing was a mixture of great fun and unutterably terrifying fear. Yes, it had that EV whine, but it also felt exactly like what it was, a glass-fibre go-kart allowed on the roads. It also wasn’t really a practical day to day car for someone who didn’t want to tinker constantly. And a loaner Morris Minor I’d driven with no brakes, original low-energy candles for headlamps and a body consisting of a mixture of rust and ductape had felt both safer and more solid. Then, in the early thousands, a she bought a Prius and… I must admit I was still not exactly all-in on the concept. I was still sticking to my (admittedly mistaken) thoughts that future lay in biofuels. Granted that was because I have a deep and abiding love for the BMC A-Series engine and I’d clung to the hope that my Minor might be able to be convinced to run on biofuels. Hell, it’s an A-Series, it’ll surely run on anything. So we sat in the Prius and she showed off the all electric mode, which I thought was quite nifty, but even with the advent of the ‘Plug-In Prius’ hacks I still wasn’t exactly sold on the concept. But there were some EVs that caught my eye. The classic Enfield is an insanely entertaining vehicle… however, our brief fling with the Enfield was an unmitigated disaster. Then there was the free G-Wiz gifted to us that was…an unmitigated disaster. Despite all this I slipped straight from the wheel of a Minor as my main drive, to an iMIEV. Fast-forward to now and my (other) job’s changed a little. Suddenly I’ve gone from cycling 4 miles to work to suddenly needing to drive 200 miles to get there. Frequently 200 miles down roads with no rapid charging. And so I slid behind the wheel of a decade old Prius. And over Christmas I realised I’d said nothing much about it since I got it. Longtime readers will know that after much searching I managed to lay my hands on a only very slightly foxed Gen 2 Prius with 144k on the clock. 14k a year isn’t too bad for a car of this size / class (Glass’s guide assumes 12k a year). And… as petrol cars go, it’s…pleasant. There’s one tiny little thing that bugs me, though. After driving electric for a while, yes, the Prius has better soundproofing, and yes, it’s a more ‘comfortable’ car for crusing in. But at the end of the day, whenever the MPG reading shifts from 99.9 I get upset. When it pops up “Change to EV mode is invalid now” as I’m trying to eek out the longest run I can in EV mode whilst leaving it with enough charge when I get home, I want to curse. 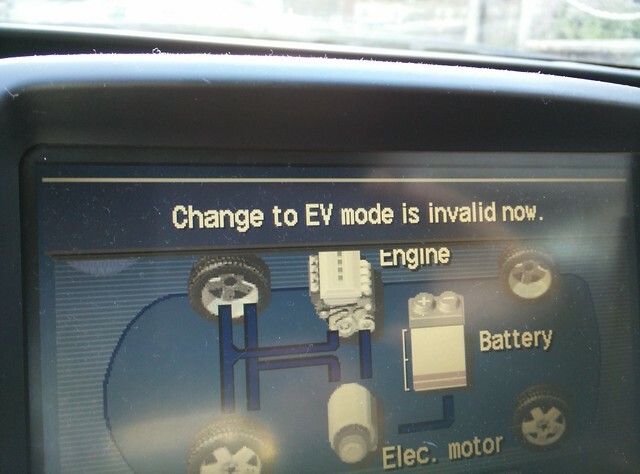 “Change to EV mode is invalid now”; a phrase to make you weep. And yes, for photographic reasons that’s a very reasonable ‘Change to EV mode is invalid’, but when it says that when the battery is 3/4 full? Oh the language is quite blue and not fit for print. Whilst the EV motor in it is way underpowered for the size of car to drive as an every day EV, it’s so, so, so much nicer to cruise quietly along in EV mode than it is to hear that petrol engine chugging away. So I am, officially broken. Which is interesting. Because a little while ago I was 10 or so meters in the air, stood on scaffolding, shooting the breeze with our roofer, an unrepentant petrol head. We were discussing the sound of a V8, as it happens, mainly because he owns 2 V8s. He was explaining to me how he would struggle against the switch to EVs because of the sound, or lack of it, although he (interestingly) was convinced that that’s where we’re going. He was was also of the opinion that like my Minor, petrol engines will become that thing that weirdo people collect and keep kicking around. And as our current kids hit middle age, some of them will be overjoyed when some Ford Fiesta clatters past, chugging filth, because the smell will remind them of childhood. But once I was a petrolhead. Like I said, the A-Series ran in my blood. The idle of a well maintained A-Series, particularly an early 803 or 948cc engine sounded like an orchestra. I’ve tinkered with engines since my pre-teens, polished cylinder heads, rebuilt engines and for a long time it seemed like my veins were filled with 2-stroke oil. But EVs are an addictive drug. Whilst their eco-credentials are why I ended up here, the fun of them, the straight-up torque filled power is a large component of why I’ve stayed. And at the end of the day, no V8 can touch the smooth power output of an AC motor at full chat. And that whine? That EV whine? Well, that’s a quick way to a smile. 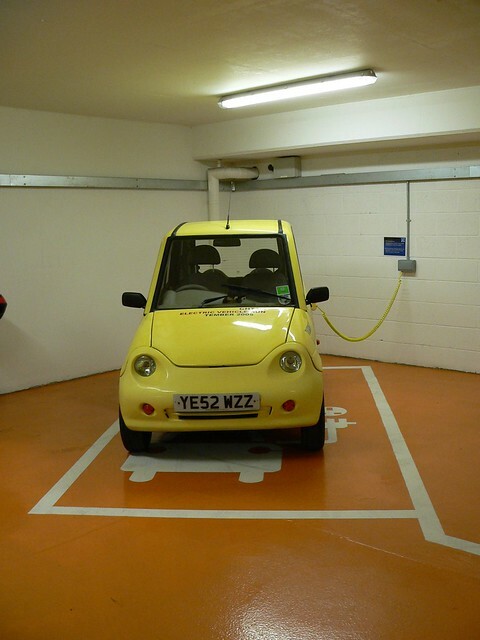 …so perhaps, just perhaps, that V8 addict, he’ll try a good EV and he’ll end up with me on the side of the EV.